Everyone is excited about the many new developments taking root in the city. New food. New shopping. New hotels. Just recently, a groundbreaking ceremony was held to mark the beginning of construction for the Rock & Brews restaurant in the Grandscape development. The land for Lions Club Park, 7.3 acres, was first purchased in 1980 for $34,882 from Fox & Jacobs. But that doesn’t mean we forget about longtime fixtures in The Colony. 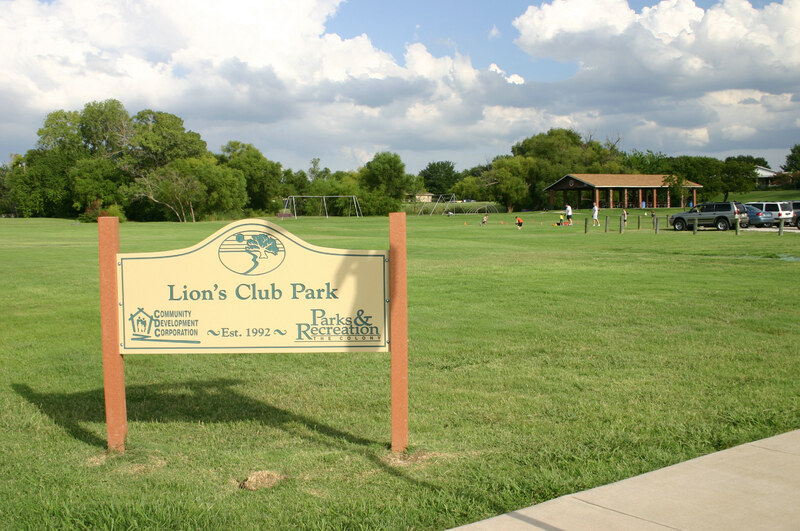 Lions Club Park was built in 1980, and has been a source of enjoyment for families in the community ever since – from fishing in the pond and youth sports, to picnics at the pavilion and live music performances. By the end of 2014, however, time had taken its toll on the pond, which had become laden with excessive silt and trees that were either dead or invasive. 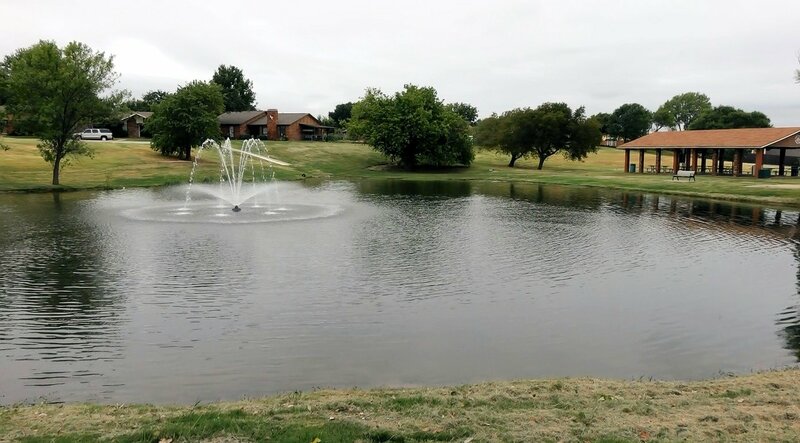 In response, The Colony City Council and Community Development Corp. board of directors authorized approximately $200,000 in funding to de-silt and clean up the pond. Community Services Director Pam Nelson, who serves as staff liaison to the CDC board, said she was thankful for the strong showing of support for the project. 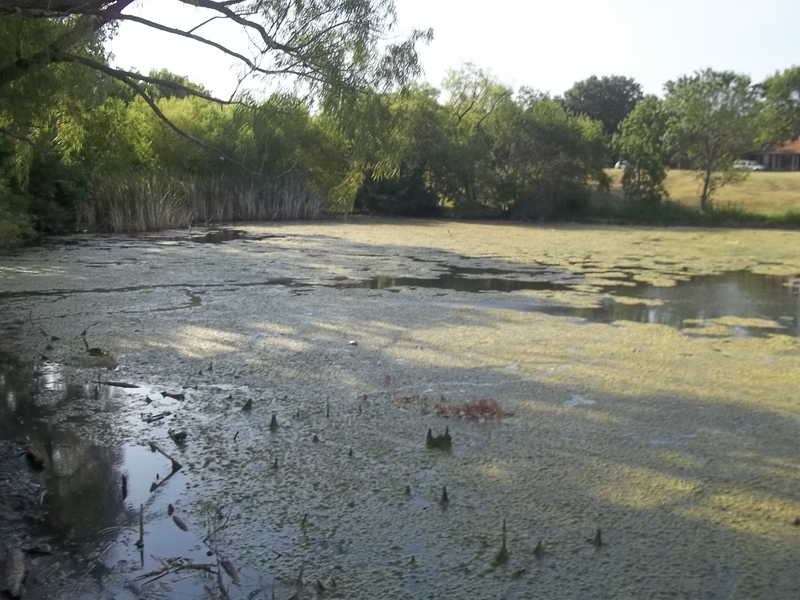 This “before” image of the Lions Club pond shows the algae build-up on its surface. The project began in January, first by relocating the pond’s fish to Scout Park. Steps also were taken to preserve a tree where a family of owls had nested. In the months that followed, the city’s Parks and Recreation Department staff members would continue monitoring the wildlife at the pond, particularly the many turtles who call the pond home. As found, they, too, would be relocated. Sometimes this even involved the tricky business of traversing mud and silt to track them down from points far into the pond. The foliage around the pond was also thinned, namely the many dead and invasive trees that were contributing to the environmental clutter. Once the pond was drained and the site clear of wildlife and debris, the city’s contractor began the work of removing the silt. During the entirety of the project, more than 4,000 cubic yards of silt were dredged and transported by the contractor for use at a site under development in McKinney. Snow in February and March delayed work on the de-silting project. As with any project, unexpected complications arise. Initially, it was scheduled to last about three months. But Mother Nature had other plans. Blankets of ice and snow fell upon North Texas in February and March. Further delays resulted from record rainfall and flooding in May and June. Every precipitation event required pumping more water out of the pond so the de-silting process could resume. Expectations were to dig out about 8 feet of silt plus 2 more feet of excavation for a healthier, deeper pond. However, contractors hit a strata of crusty sediment at 8 feet instead, with another 5 feet of silt below that. Faced with rising costs, the CDC board of directors was adamant that the project be done right and that the finished product be something residents would be able to enjoy for many years, as well as sustain future special event traffic. So instead of a 10-foot pond, it ultimately became about 13-feet deep, with an additional 1,300 cubic yards of silt removed. Considerable silt build-up was also found along the sides of the pond, meaning the excavation would result in deeper drop-offs at the pond’s edge. Additional soil had to be brought in for fine-grading work to create a “shelf” and shore up the sides, leaving about 10 feet of wading room for fishing before it drops off. Significant work was also required on the drainage channel extending down from Jennings Drive. Both the contractors and the city’s Public Works crews worked to repair and unclog the channel and install new erosion control features to prevent future clogging. Contractors lay fresh sod around Lions Club Park. The new drainage channel is also shown. 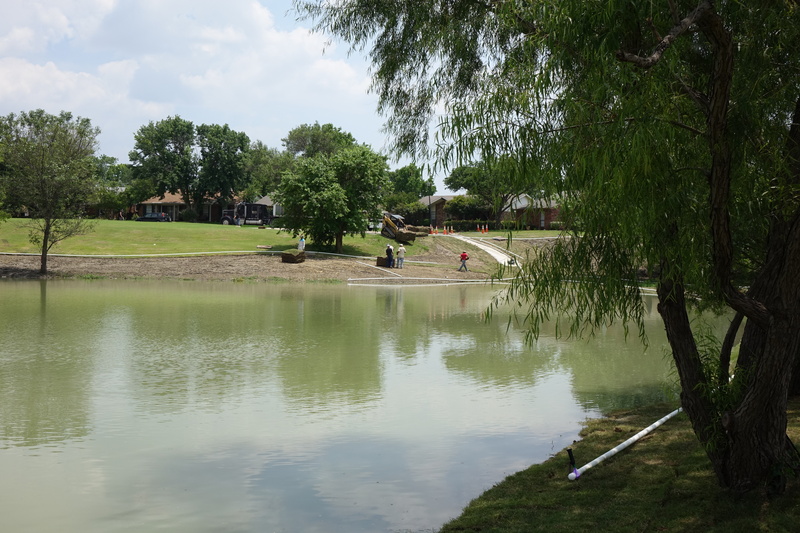 Once all the silt was removed and grading work complete, fresh sod was laid all around the pond and temporary irrigation was installed to ensure the parkland was lush and inviting. The finishing touch came in August with the installation of a $5,000 electrical fountain, with a spray of 10 feet by 36 feet and LED lights. Parks Development Manager Eve Morgan said this project should preserve the park’s condition for many years, as residential development in the pond’s radius is stable and complete. Most of the silt removed from the pond was the result of ongoing construction runoff over the past few decades. All that’s left is to restock the pond with fish, which will take place sometime this fall when temperatures cool. Young fish are more likely to survive the restocking process in cooler weather. 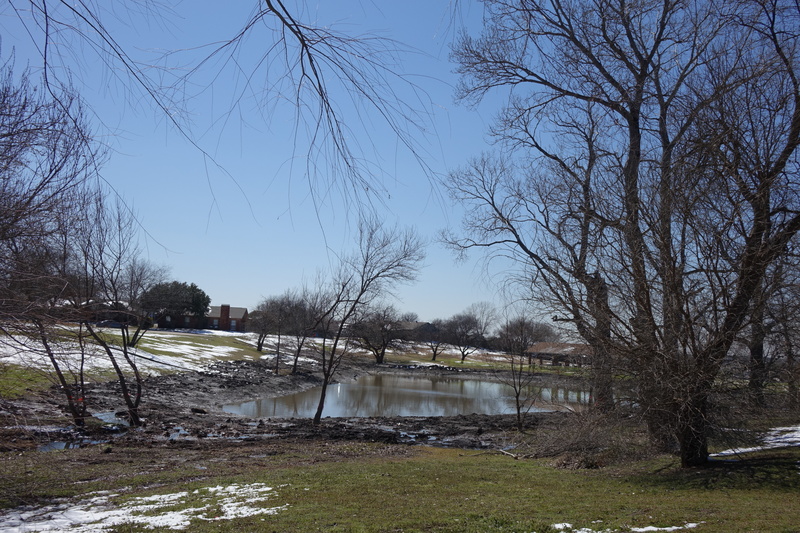 While it took more than twice the amount of time anticipated to complete, the Lions Club Park de-silting project of 2015 represents a major milestone in The Colony’s park maintenance history. A new electrical fountain adorns the Lions Club Park pond. Public Works crews also recently completed repairs to a broken storm drain underneath the park’s playground. The break occurred during the torrential rains in the spring. With all work at the site completed, the city hopes to host a variety of special events at Lions Club in the years to come, such as kid-fish activities and the return of live musical performances. Morgan wished to thank the surrounding residents for their patience, and shared their enthusiasm for the finished product.